Ohio has large areas where soils are shallow to a limiting condition making them too shallow to install a leaching trench or mound system. A sand bioreactor is a special type of home aerobic treatment unit, where septic tank effluent is applied to layers of specially sized sand to remove pollutants. The clean, odor-free effluent from a sand bioreactor can be dispersed in a spray or drip irrigation system. If an off-lot discharge permit (NPDES permit) is obtained, the effluent could be discharged to a stream. A sand bioreactor is constructed in a water-tight basin to keep groundwater out of the sand. A plastic liner, similar to a swimming pool liner, is usually used to construct the basin. A drain is placed in a layer of gravel at the bottom of the basin. Then a 2-foot deep layer of specially selected sand forms the main part of the treatment unit. The bioreactor size depends on the number of bedrooms in the home. For a 3-bedroom home the system takes up 360 square feet. Figure 1. Septic tank effluent (left) and sand bioreactor effluent (right). Figure 2. 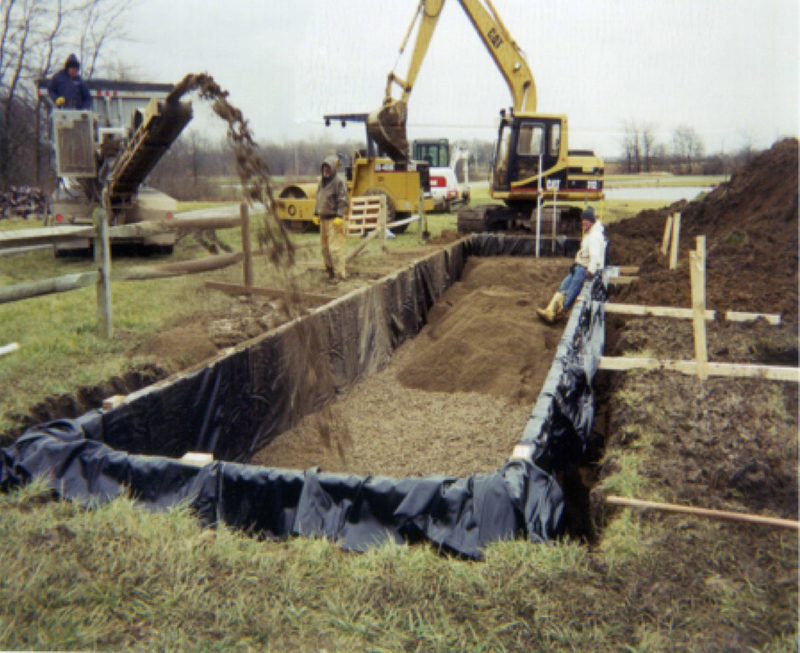 Sand bioreactor being constructed in a lined excavation. This system is 50 ft by 10 ft and treats 500 gallons of wastewater per day. On top of the sand, rows of pipes with small holes are installed in another gravel layer and a pump is connected to apply the wastewater in small doses. Finally the bioreactor is buried under a layer of landscape fabric and soil fill that is planted with grass or other non-woody vegetation. The only part of the bioreactor visible on the surface is small valve boxes at the end of each pipe, so the pipes can be flushed out and checked for clogging. Figure 3. Diagram of a sand bioreactor system. The sand creates a place for microbes to grow that consume the wastewater pollutants. The sand also provides pathways for the air and wastewater to flow through the bioreactor. Dosing the wastewater several times throughout the day is important to make sure plenty of air reaches the microbes and evenly distributes the wastewater over the entire bed of sand. No aerators are needed to force extra air into a sand bioreactor system. Figure 4. Microbes grow on sand surface and consume wastewater pollutants. Septic tank effluent is applied to the sand surface with a pump through a pipe network. The pump should be checked annually. Also each year, the pipes should be flushed out to minimize clogging the small holes. 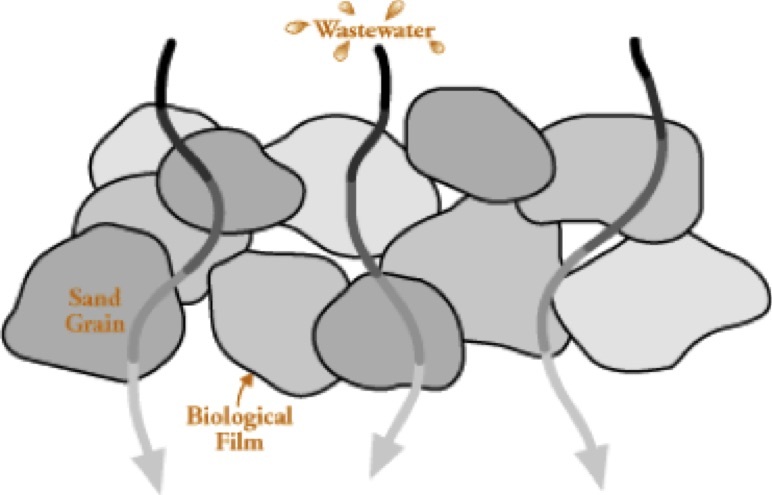 Sand bioreactor effluent may require disinfection before dispersal through a spray irrigation system or discharged to a stream under an NPDES permit. 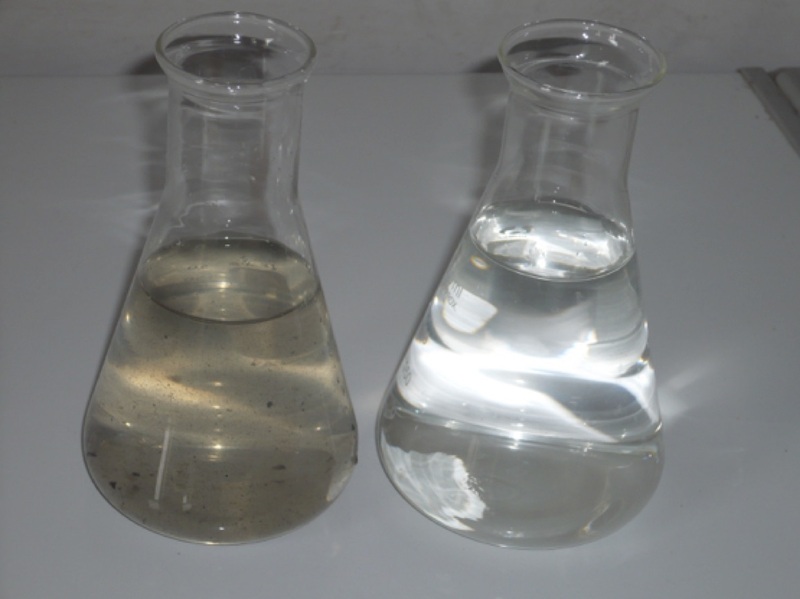 UV light systems and chlorinators both work well to disinfect sand bioreactor effluent. To learn more about sand bioreactor design and construction look at Bulletin 876, Sand and Media Bioreactors for Wastewater Treatment in Ohio Communities, available on the website for the Soil Environment Technology Learning Lab, setll.osu.edu.